Pianist Jean-Yves Thibaudet continues to enthrall audiences worldwide with his profound and poetic artistry, enlightened interpretations and thrilling performances. Hailed as “one of the best pianists in the world,” Thibaudet is sought-after by today’s foremost orchestras, festivals, conductors and collaborative musicians for his virtuosity and charisma. 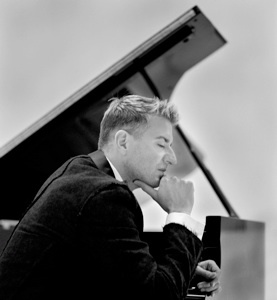 Jean-Yves Thibaudet was born in Lyon, France, where he began his piano studies at age five and made his first public appearance at age seven. At twelve, he entered the Paris Conservatory to study with Aldo Ciccolini and Lucette Descaves, a friend and collaborator of Ravel. At age fifteen, he won the Premier Prix du Conservatoire and three years later, won the Young Concert Artists Auditions in New York City. In 2001, the Republic of France awarded Thibaudet the prestigious Chevalier de l’Ordre des Arts et des Lettres and in 2002, he was awarded the Premio Pegasus from the Spoleto Festival in Italy for his artistic achievements and his long-standing involvement with the festival. In 2007, he was awarded the Victoire d’Honneur, a lifetime career achievement award and the highest honor given by France’s Victoires de la Musique. Jean-Yves Thibaudet is an exclusive recording artist for Decca, which has released over 40 of his albums. His many awards include the Chevalier de l’Ordre des Arts et des Lettres from the Republic of France, the Premio Pegasus in Italy, and the Victoire d’Honneur, a lifetime career achievement award.